The Feast of the Presentation of Christ in the Temple that we celebrate today, is also known as Candlemas. For Anglicans in the northern hemisphere, this Feast, that dates back to the fifth Century, is a reminder of the coming of light in the darkness of winter as they look forward to the arrival of Spring. In many places, candles are blessed and lit in dark churches on this day, as a symbolic reminder of these things. As so often happens when we adopt northern hemisphere liturgies directly into our Australian context, some of the symbolism is lost, as we mark it in the middle of our bright hot summer where we long for some cooler, darker days! 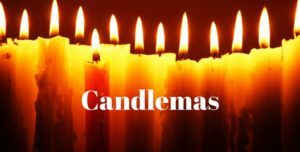 And yet Candlemas is an important Feast, another Epiphany moment when the baby Jesus, born so unremarkably, is known and recognised as the one sent from God, the Messiah. It also points us towards Easter, that other day when lights are lit at dawn to remind us of the Christ, not only born for us, but resurrected from the bonds of death to be the light of our world and of our lives.